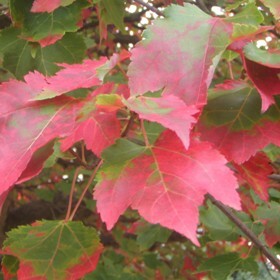 Flaunting its blazing red leaves, this maple from North America is a spectacle to behold this autumn. The name rubrum, however, actually means ‘red-flowered’, referring to the reddish features on the bare branches in early spring. Residing naturally in swampland areas, the tree will thrive in a boggy garden site. It is also fully hardy, and can tolerate temperatures as low as -15°C. The sap of the relative A. saccharum is a key source of maple syrup, which can be tapped in early spring.